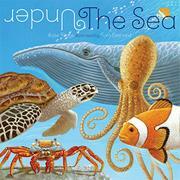 A board book shows the ins and outs of sea life. Each exotic creature is placed clearly in relation to its habitat. The seaweed at the BOTTOM of the sea is opposite the crab that climbs on TOP of the rock. In contrast to the lightweight type used for the bulk of the text, the directional prepositions are highlighted by a bold display type. Just four pairs of words and eight underwater critters are featured—perfect for the youngest oceanographers’ attention spans. Leonard’s books for older readers established him as a keen observer of wildlife. The same dual respect for nature and his audience is evident here. His illustrations are scientifically accurate while underscoring some playful elements to intrigue the board-book audience. The eyes of these sea creatures seem to be watching readers, adding to the feeling of wonder and mystery invoked by this exotic environment. Riggs’ text is equally respectful of the young audience. Although appropriately using only one line of text per page, she does not shy away from sophisticated vocabulary, accurately placing the clownfish in a bed of anemone. She trusts her young readers to understand the word “breaches” simply by seeing the whale rising out of the water.